Rama Block is an experienced musician and teacher. 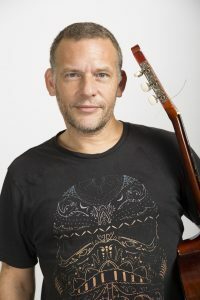 He sings and plays bass, guitar, drums, keyboards and double bass professionally in several bands which can be seen at gigs and festivals across the country and abroad. He has been a session musician with such organisations as the RTE orchestras, Kíla, Hazel O’Connor, Pure Blind Panic and many more. He currently runs the Kilmacud Music Centre and teaches music in Dundalk Institute of Technology and several secondary schools. His emphasis is strongly on enjoying playing music. Since 2012, Rama has been teaching Rock Schools and instrumental tuition with Music Generation Wicklow. He is currently in 11 bands which can be seen playing all over Ireland and abroad. The band, Nursery Crimes, which he set up in 2008 with his 3 youngest sons (then aged from 4 to 10) have become very popular, drawing large crowds at KnockanStockan Festival and receiving rave reviews from music magazines such as hot press.